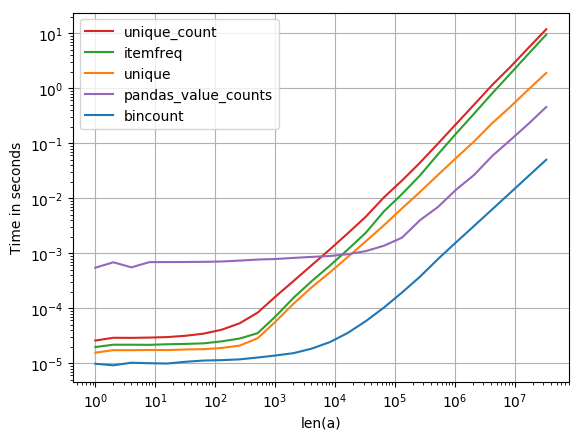 In numpy / scipy, is there an efficient way to get frequency counts for unique values in an array? or however you want to combine the counts and the unique values. This is by far the most general and performant solution; surprised it hasn't been posted yet. Unlike the currently accepted answer, it works on any datatype that is sortable (not just positive ints), and it has optimal performance; the only significant expense is in the sorting done by np.unique. Even though it has already been answered, I suggest a different approach that makes use of numpy.histogram. Such function given a sequence it returns the frequency of its elements grouped in bins. Beware though: it works in this example because numbers are integers. If they where real numbers, then this solution would not apply as nicely. Old question, but I'd like to provide my own solution which turn out to be the fastest, use normal list instead of np.array as input (or transfer to list firstly), based on my bench test. Check it out if you encounter it as well. While the accepted answer would be slower, and the scipy.stats.itemfreq solution is even worse. A more indepth testing did not confirm the formulated expectation. Ref. comments below on cache and other in-RAM side-effects that influence a small dataset massively repetitive testing results. There's redundancy here (unique performs a sort also), meaning that the code could probably be further optimized by putting the unique functionality inside the c-code loop. Also, this previous post on Efficiently counting unique elements seems pretty similar to your question, unless I'm missing something. Not the answer you're looking for? Browse other questions tagged python arrays performance numpy or ask your own question. numpy - how do I count the occurrence of items in nested lists by index?